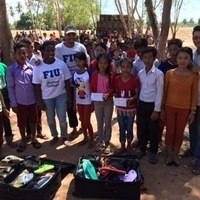 The Global Civic Engagement Student Advisory Board is a program at the Center for Leadership and Service funded by Wells Fargo to expand global awareness and community engagement by supporting student-led service projects. Students are encouraged to develop projects that address issues regarding any social issue such as: public police, education, the arts, environment, economic development, community beautification, health and many more. Selected project proposals may receive a mini-grant up to $1,000. Projects will be due by the 5th of each month for consideration. Please allow 10-15 business days from the monthly due date for award notifications. The final deadline for applications for the 2018-2019 year is April 4th, 2019 by 5pm. Applicants must be enrolled as an FIU student during the period of the project. Only volunteer projects are eligible. To apply for a mini grant cycle, visit leadserve.fiu.edu and click Funding Opportunities. For questions, contact Amanda McDole - Assistant Director in the Center for Leadership and Service - amcdole@fiu.edu or 305 348 6534.